If spending hours on baking perfect pumpkin cinnamon rolls doesn’t scare you, this recipe is exactly what you wish. Pumpkin cinnamon rolls are great for the whole family, making it a tasty addition to your Thanksgiving or Christmas dinner. Preheat oven to 350. In a large bowl, combine flour, yeast, sugar, 2 tablespoons of pumpkin pie spice, and salt. Allow to stand for a while. Turn the dough out onto a lightly floured work surface, and knead until elastic and smooth. Don’t worry if your dough is a bit sticky. Form the ball, place it into a greased bowl, cover with a cloth, and let stand in a warm place for 40 minutes. Brush the dough with melted butter. In a small bowl, mix 2 tablespoons of pumpkin pie spice with brown sugar, and sprinkle over the dough. Grease your baking sheet. 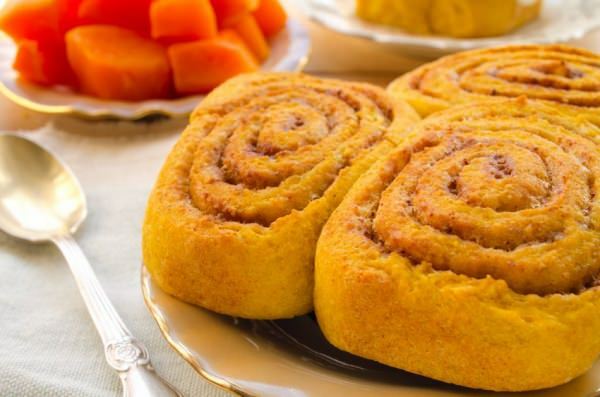 Form your pumpkin rolls, and bake for 35-40 minutes or until lightly golden brown. Meanwhile, combine the melted butter, vanilla extract, sugar, and milk. Spread the glaze over your pumpkin rolls right after they come out of the oven. This holiday season, outfit your pantry with the ingredients necessary to make incredibly healthy and unbelievably delicious pumpkin meals. I think, we should always have pumpkins on hand when the cold season comes. They’re jam-packed with nutrients, easy to cook and can be used in many recipes. What are you go-to pumpkin recipes?